The election of an openly lesbian Bishop in The United Methodist Church is a necessary step to a fully inclusive UMC. I’m a cryer. I cry at commercials sometimes. But I hadn’t planned on crying at Jurisdictional Conference of the Western part of United Methodism and its plethora of historic moments. There’s a family dispute. My son is a delegate also and he supports someone else [for the episcopacy] not me. I see myself as someone who is standing between two doors. One door you say is open, but I can tell you it is open, but not too wide for us from the Pacific Islands, we can’t fit. We need it a little bit open wider. I’m willing to lay it down my life, my body, to hold the door so some people can walk free. On the other side of the door are my people who close doors to themselves. And I am willing to kick the door, and I pray that my people will open their minds. I pray my son, and other LGBTQ people, will walk freely on the bridge that I lay down my life to a wide door where people with open hearts will welcome them. I have a dream for the future that my son will walk freely in that room. I find Rev. Sifa’s image an apt metaphor for the Western Jurisdiction of The United Methodist Church in particular. On one side, we have people who say “the door is open” to LGBTQ people in The UMC, but it’s too narrow. LGBTQ people do not actually fit all the way through. They need it open a little wider. On the other side, we have people outside the church who say that there’s nothing within the Church for LGBTQ people, and we need to even enter the doorway to do good in the world. Our call is to lay down our bodies between the two doors to prop them open, to allow people inside and outside the church to walk freely in the full knowledge that LGBTQ persons are loved by God, are called to serve God at all levels of the church, and are transforming the world. The West, in particular, is choosing to lay down our bodies. To be trampled on by the rest of The UMC. To be humiliated, hamstrung, and harmed by policies, speeches, and practices. We are laying down our bodies, submitting to the discipline of the Church, in order to wedge open these doors with our very bodies and transform the world. It almost seems “well, duh” then that the end result of the process was the election of Rev. Dr. Karen Oliveto as our bishop. On the 17th ballot, the Western Jurisdiction of The United Methodist Church elected Rev. 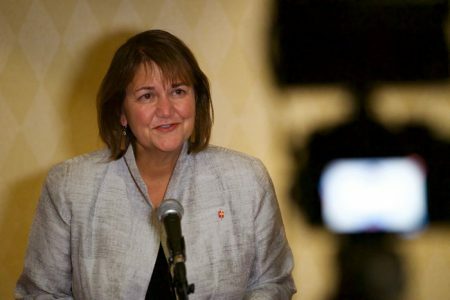 Dr. Karen Oliveto as a Bishop. Oliveto is the first bishop elected whose non-straight orientation was known before election. Oliveto is the Senior Pastor of Glide Memorial Church in San Francisco, California. There were 9 candidates for one episcopal position. 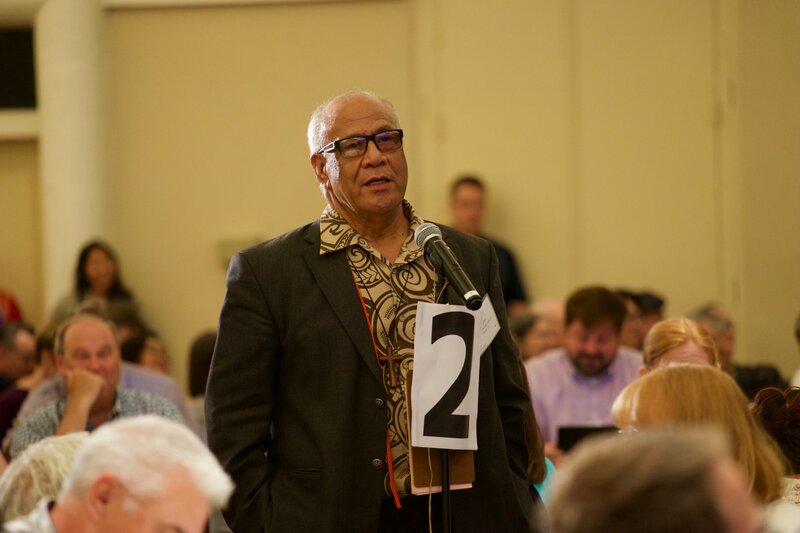 Most Annual Conferences in the Western Jurisdiction passed resolutions that said sexual orientation should not be a consideration for qualifications to be bishop. The 2012 Discipline only indicates that “Elders in good standing” are eligible to be Bishop, and many Annual Conferences interpreted that as not a bar to sexual orientation. All of the episcopal candidates in the West are in good standing. While there will be legal and judicial challenges to this decision, the Book of Discipline is quite clear that Bishop Oliveto was both qualified to be elected, and the Western Jurisdiction was able to choose her. I’ll keep you informed. I was born into a United Methodist Church that discriminated against LGBTQ people. So were my young daughters. May they not grow up in one. 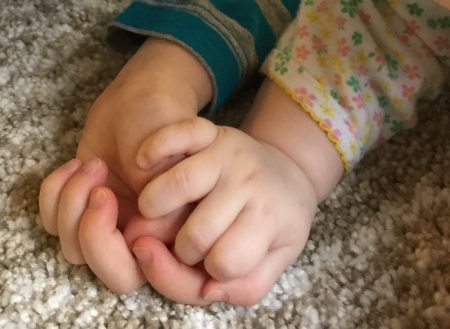 And today, I can introduce them to a LGBTQ bishop, so they will grow up knowing that no matter who they love, they can follow God’s call at every level of The United Methodist Church. A historic moment not just for United Methodists but for LGBT and other hurting people of God who have been waiting outside the walls of the church for the Sanctuary to open for too long. Too many have been waiting prayerfully and patiently to walk inside our sanctuaries and welcomed as those lost and missing sheep who have now been found. We want to pray ‘with’ you, lift our voices in song ‘with’ you, worship ‘with’ you, share God’s table with you and be loved by you… Light has truly entered our darkened world where too many have found to much comfort for far too long. Our nets have been dropped and now we can all follow, all, as one family, all part of the same vine. May God bless you Bishop Oliveto in all that you do as you work to bring God’s Grace, God’s hope, and God’s love to ‘All’ of us..
At least six Protestant churches in Portland have weekend worship attendance that is 1 to 4 times that of all 25 United Methodist Churches in Portland combined (1446 at last count). Several of those churches were publicly praised by Sam Adams, first openly gay mayor and very secular politician of a major US city, for their tremendous practical ministry to the poor, especially children. This includes writing the introduction to a book describing this collaborative approach authored by Kevin Palau (son of evangelist Luis Palau). All 6 churches are creative, innovative, filed with thousands of young adults and families, and not in the pocket of the right wing of the Republican party. And all affirm the historical Christian sexual ethic that some say is killing the church. These churches are making disciples and, through that, making a difference. Meanwhile over the last decade the UM church in Portland have dropped 15-20% in attendance and captured .02% of the population in weekly worship. And please don’t say it’s not about the numbers unless you apply that same approach to your own paycheck. This all raises the possibility that the global Wesleyan family teaches what it teaches regarding sexuality not because they are bigots, or stupid, or merciless, or legalistic, or on the wrong side of history or moral first cousins to segregationists and slave-traders (or call names to those who disagree with them). Maybe they teach it because it’s true. Thoughts? We are ALL children of God! I am well pleased by the courage our fellow Methodists have taken at this Western Jurisdictiona Conference and proud to welcome All Children of God. So much for “Holy Conferencing” and honoring commitments made at the General Conference. Thanks for your article, Jeremy. I do not know Rev. Oliveto, but my prayers will go with her. It is never easy to be a trailblazer. I am apparently also a cryer, because I was also crying when I watched the video of Rev. Oliveto after she was elected as bishop. What a beautiful moment for our church. I’m a crier, always have been. I cried as Rev. Sifa spoke. I cried again as Skip withdrew. I was prepared to hold my breath for the next vote and then Dottie stood, spoke and withdrew – leaving me seriously crying. I have never seen such grace and generosity of spirit as those 3 individuals showed us, the UMC, last night. And then, then I really cried, as the WJUMC voted 100% for Karen. THIS is the future with hope (GC08 tagline) we’ve been hoping, waiting and praying for. Just for the record, Siosifa is the Tongan pronunciation for the Biblical name, Joseph. He is pastor of an all-Tongan Laurel UMC, Oakland. I’m proud to say I received the first of the Tongan members back in 1974. Tonga is the only world country where the official religion is Methodist. God says His Word is final on everything. God says His Word is complete and perfect. In Acts 20, we see that the elders at Ephesus are also referred to in Paul’s message to them as overseers, the same Greek word translated bishops. Therefore, elders are bishops. The qualifications for elders/bishops are given in Timothy and Titus. Why would man choose to use anything different from God’s specifications? While you have the Bible open, take a look at God’s message to us in Romans 1. God’s plan never changes. Are YOU going to follow Gods commands as given through the Holy Spirit to the Apostles or listen to those teaching false doctrine? It’s your eternity that is at stake. Rushane, you could not be more wrong. Paul, I watched most of this video. I would have to say that it is one of the most convincing videos I have ever seen to support us gays. Of course I had my own experience of not changing through psychotherapy, but this video is exceedingly poignant and should be shown everywhere. Also, (this is more a question of Jeremy, rather than Paul) WHY does this website accept advertising from Franklin Graham? He is one extreme arch homophobe. He feels nothing but pure loathing for gay persons.